Jackson Pollock might be the PERFECT artist to study first when you begin exploring art history with your kids. His art is energetic, messy, and fun to make! I participate in the Amazon Services LLC Associates Program, an affiliate advertising program designed to provide a means for sites to earn advertising fees by advertising and linking to amazon.com. By purchasing your books through this site, your price does not increase, but a percentage of your purchase goes to supporting Art History Kids. Thank you! To begin your study, you can check this book out from the library, or pick it up at your local bookstore. 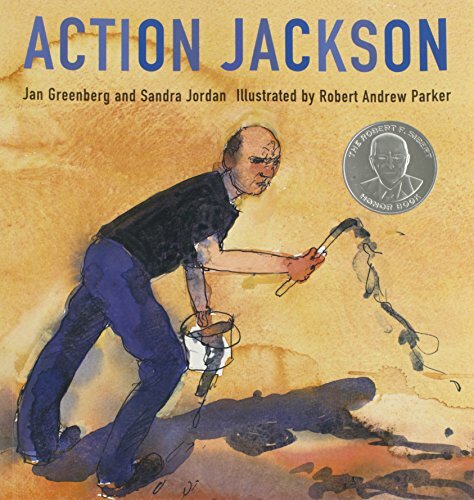 Action Jackson is a great age appropriate introduction to the Jackson Pollock's life and art. He was know for his "drip paintings" where he would splatter, splash, and pour paint directly onto his canvas while it was flat on the ground. utensils to "drip" the paint– popsicle sticks, paintbrushes, plastic spoons, etc. Dress your kids in clothes that can get messy, and lay the paper or boards down on the ground outside where it will be easy for you to hose off the extra paint when you are done. Give your kids the paints and utensils and invite them to create their art! As they start creating their art, you can act as a passive observer, and "narrate" their actions to help make them aware of their process. Point out how different utensils distribute the paint differently. You can tell them that Jackson Pollock was known for moving around his canvas like he was doing a dance with his painting. Invite them to apply paint from all sides. Jackson Pollock's art was all about being in the moment and focusing on the act of making art more than what the final product would look like. Have fun, and remember to leave their art flat until it is completely dry, so it won't drip right off the paper. I'd love to see your finished paintings! Post them on Instagram and use our hashtag #arthistorykids. And, if your kids are ready to learn even more about Jackson Pollock and his Abstract Expressionist art, this guide is currently on sale... for a limited time only! Use the code JACKSON at checkout to get $5 off!! 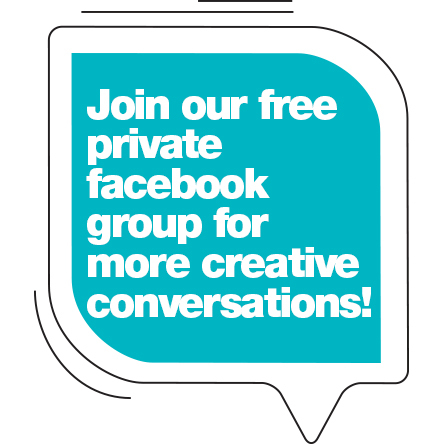 Enjoy this week's art time with your kids, and be sure to click the links below to stay connected on social media.